Sold by Fun-Land-Play US and Fulfilled by Amazon. Gift-wrap available. 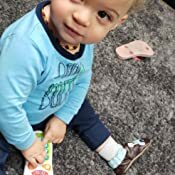 BABY'S CURIOSITY: Baby above 6 month old is curious to everything, vatos baby remote control toy & baby hammer, let baby’s curiosity take itself to develop its exploration. 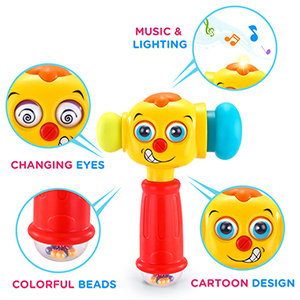 ENTERTAINING & LEARNING MODE BABY HAMMER-- Under entertaining mode, The baby hammer toy will have many different funny sounds. Pound it to learn counting and numbers, from number 1-10 under learning mode. 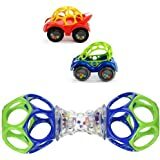 These different modes will develop baby's desire of exploration. 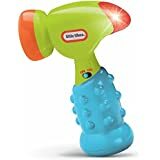 SUPER FUNNY BABY TOYS & PROMOTE MUSULE EXERCISE-- VATOS baby hammer toy provides knock, pond, shake, grip and other hand training exercises, which can promote the development of baby's muscles. 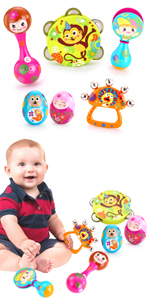 Also the cartoon design, music & lighting, colorful beads infant toys will make baby laugh out loud. 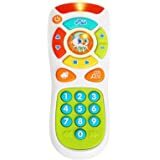 TOP SAFE & SMOOTH AND SIZEABLE HANDLE & BEST BABY TOYS GIFTS FOR 12 TO 18 MONTHS UP- The hammer toy& Baby remote toys is non-toxic ABS, BPA Free, Lead Free, Phthalate Free with smooth and sizeable handle to protect baby's hands. 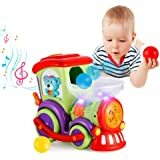 It's a best infant toys gift for 1 year old boys and girls. 2*1.5V "AAA" batteries required (not included). Sold by Fun-Land-Play US and ships from Amazon Fulfillment. 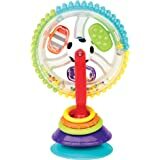 This is the best toys for baby 12-18 months up boy and girl. 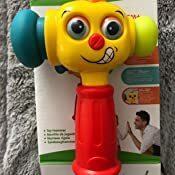 With function of changing eyes, music & lighting, learning mode, colorful beads, soft rubber head, smooth & sizable handle, which can develop baby's grab ability, muscle practice, desire of exploration. Meet all the scientific exercise for 1 year old baby boy & girl. It's also the best baby toys gift for 12- 13- 14- 15- 16- 17- 18 months + old baby. Absolutely Safe Baby toys for 12 to 18 Months + We, Vatos, are aim to provide infant toys with safe and funny, made of safety materials. 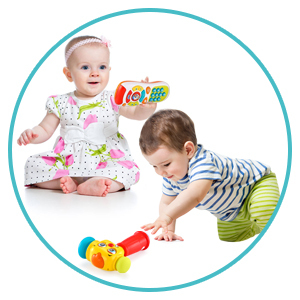 All of our baby toys are made of non-toxic material, BPA Free, Lead Free, Phthalate Free. Please recognize our brand "VATOS". 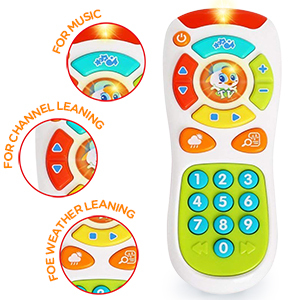 This baby toy remote lets your child surf through nine different channels that include pretend news and weather for role-play fun. Volume and channel control buttons teach the concept of opposites. 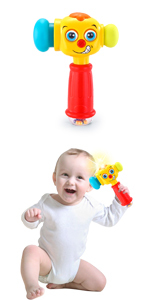 Baby Can Click His Way To Playtime Learning Fun It clicks with baby’s development. Pressing buttons helps give motor skills a fun workout. The realistic styling and light-up screen inspire early role play fun. And the lights, fun music, phrases and bright colors help strengthen important senses like sight and hearing! 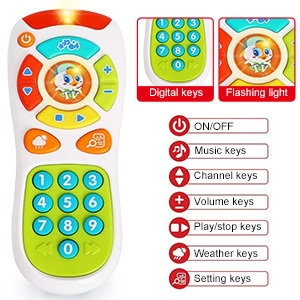 The toy remote control is good for Baby’s language Development , with daily language of channels , weather ,it is good for baby to imitate the pronunciation and accumulate words, developing the ability of language while playing . 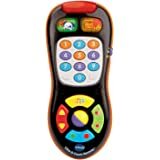 This TV remote toy is for children 6 months to 3 years old; Best Choice for 1 year old boy gifts girl gifts. 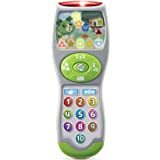 Learning Mode - Turn the button to learning mode, the baby hammer toy will show your baby numbers and counting, which can develop language skill. Funny Eyes - When you pond the baby hammer, the cute cartoon eyes will be turned into another eyes. Enhance their observation ability. 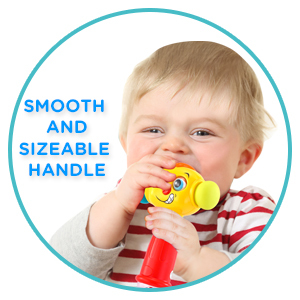 Soft Rubber Hammer Head - As the baby is active, our soft rubber baby hammer toy with smooth, sizeable handle can prevent your 12- 18 months + baby from harm. Colorful Beads - When you shake the baby hammer, you can make a rustling sound from the bottom of handle to attract your baby's attention. 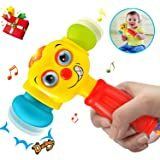 Entertaining Mode - The baby hammer will trigger different funny sounds, bring your baby a lot of fun when they hear the sound effect. 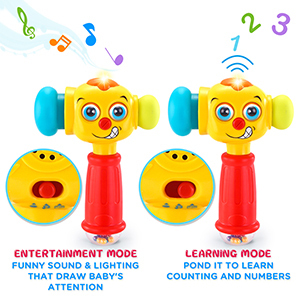 Learning Mode - Turn the button to learning mode, the baby hammer toy will show your baby numbers and counting. 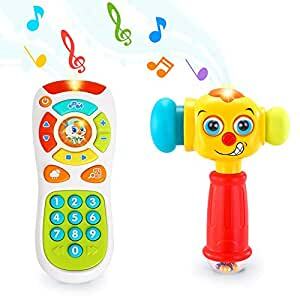 Music & Lighting- Each tap will trigger funny sounds and lights to draw baby's attention; When press the head button of baby hammer toy, it will play music or songs to attract baby to grab. Colorful Beads - When you shake the baby hammer, you can make a rustling sound from the bottom of handle to attract your baby's attention. Channel keys: Imitate the real TV remote setting to swift different channels by up and down key . Baby can experience the reality during imitation . Weather keys: Include different weather phenomena such as cloud, sun,rain,fog and snow. Volume: 2 different volume levels suit for different environments. Play/stop keys: Learn the shapes of square and triangle with red remote controller sounds. Music Enlightenment: The selected abundant nursery rhymes and music teach baby numbers and weather delightfully. And help baby to accumulate life experience. 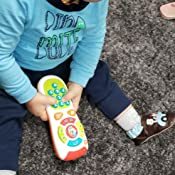 Channel Learning: Imitate the real TV remote setting to swift different channels by up and down key.Baby can experience the reality during imitation. Weather Learning: Include different weather phenomena such as cloud, sun, rain, fog and snow .The abundant voices and recognition can teach baby knowledge in playing. 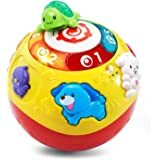 Loved by thousands of mom, Born from CEO James Lee, who wanted to find a safe, quality, funny as well as educational for his daughter and he believes great toys could develop kids' ability on social skill, concentration, imagination etc. Soon afterwards, he started to walk through China to develop top manufacturer. Finally, with strict requirements, Vatos have developed great educational toys for 3M baby to 14 year old kids. 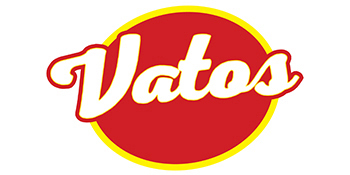 Also Vatos aiming to provide more excellent toys in the following year. 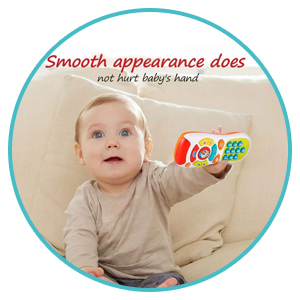 This baby remote not suitable for children under 6 months. Insert and use batteries correctly under adult supervision. Do not play in the wet area. 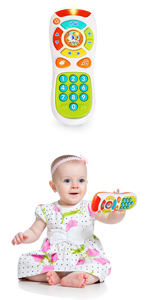 When this remote toy is damaged, stop using or playing it to avoid causing harm. My 5 month old loves the bright colors and lights. It’s one of his favorite toys. My only complaint is that some of the sounds that come from the toy sound like something from an adult film. We get some strange looks in public for sure! The voice has a thick Asian accent and speaks broken English. Seems sturdy. Baby enjoys the lights and buttons. The voice is obviously not a native English speaker as there is a heavy Asian accent, the words are not always easy to understand, and the grammar is questionable. "Let's go to have snowball fight!" is a sample. If I could just turn off the voice (which also is pretty annoying) but keep the lights and sounds, I would. We take this baby remote everywhere with us. 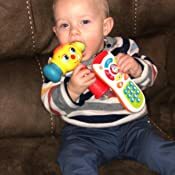 My son is 11 months old and can push the buttons easily. His little hands are able to maneuver the remote around in varying positions. And he'd attracted to the bright colors. The music and sounds are positive reinforcement that keeps him interested. We took this on vacation with us (other airline passengers may not have been so thrilled with the sounds, but it kept my son happy); it goes to the dance studio, dr appointments, friends houses. It lives in our diaper bag and he knows where to get it from. Only down side is that there is not a volume button, only an on and off button. Great toy for little hands and little people- my son has been playing with this for over a month now. I bought this about a month ago for my 7 month old son. Product is well made and fits the description perfectly. As some of the other reviews state you can tell with some of the words the recording isn’t done by someone with English as their first language however everything is said very clear, nothing to keep me from repurchasing in the future. 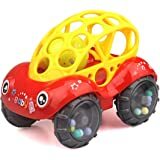 My son loves this toy, it’s his go to toy while on the go and it’s enough to keep him entertained for awhile! Thanks for a great product, keep up the good work! Absolute must have for your little one! Both of these toys keep my little guy happy and playful for hours. They both sing songs and the phone teaches him numbers. 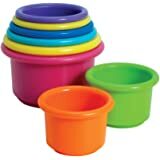 I would recommend this set of toys to any family or friend looking for a reliable toy. When I opened the toy and put brand new batteries in it, no lights or sounds. Clearly it is broken and the seller does not allow returns. Guess my baby daughter is stuck with a brand new BROKEN toy. Disappointment. 5.0 out of 5 starsCould use improvement. While I was not initially super pleased with the product, the manufacturer has indicated that they plan to improve upon my major problem with it -- the voice recordings. Otherwise this is a fantastic little toy, and the attention and response from the seller has been above and beyond. These are great should’ve bought them before he turned one because he knows they aren’t the real deal but he did play with them. They are cute and entertaining. I recommend while they are infant.